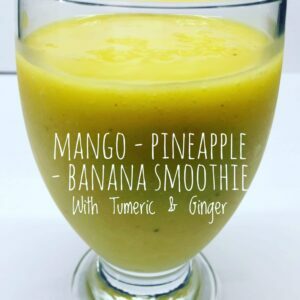 Put cut up bananas, defrosted or fresh mango chunks, pineapple chunks, fresh ginger, the turmeric powder into a blender. Add the coconut milk* and enough water to make a smooth mixture. pomegranate seeds into a blender. 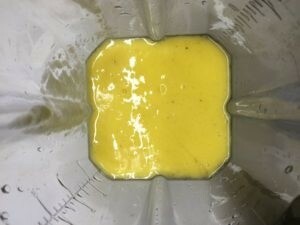 Then add water and blend until really smooth. 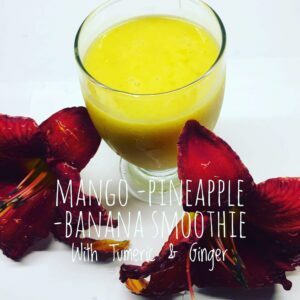 Mangoes are a very good source of vitamin A which is helpful in promoting eye health and preventing macular degeneration, night blindness and eye dryness. Vitamin A, together with vitamin C. are excellent vitamins for promoting skin health as well. Pineapples contain the enzyme Bromelain, which is a powerful agent against inflammation. Brmelain is instrumental in fighting against arthritis, allergies and other inflammation-related issues. 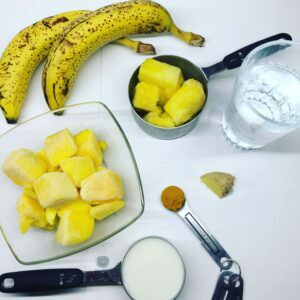 Bromelain also helps in promoting good digestion. Bananas are an excellent source of fibre, which is necessary to promote healthy digestion. The high potassium content of bananas helps to keep blood pressure levels low. Bananas are also a good source of magnesium, which helps to maintain a healthy nervous system. Both magnesium and potassium are also important in healthy kidney function. Have You Tried Persimmon Nog?